Twitter is a great medium to reach out to people be it your area of interest or the industry that you work in. You get to meet and interact with so many people that it just constantly keeps you up and motivated! 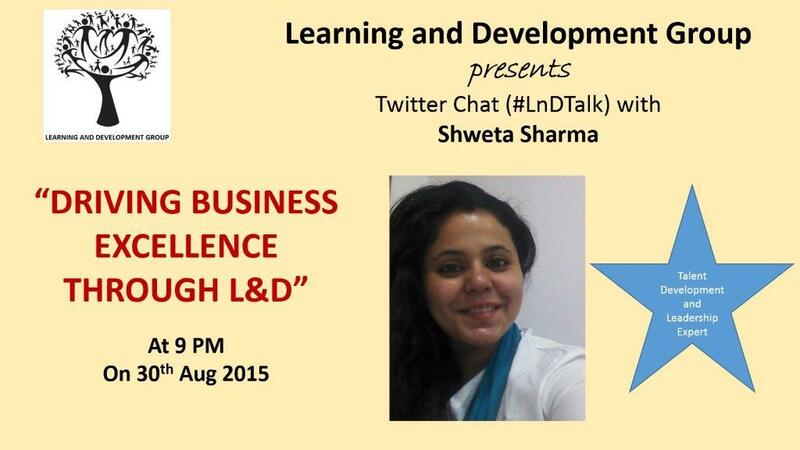 On Aug 30th 2015, I conducted another twitter chat on ‘How to Achieve Business Excellence through L&D’. The last chat – How to Design Learning – gave me much indication that leaders across the industries and verticals are actively looking for solutions to develop their team-members; and so I chose to host another one on this topic. Once again, the response was overwhelming. Got loaded with questions and all had to be answered quickly and in bite-sized thoughts! The credit for enabling this forum again goes to Surya P Mohapatra, India Leader – Head Knowledge and Capability at Hewlett Packard Global Business Services, and L&D Global – Learning and Development Group. Divya: How can L&D help and support the business to drive innovation? Me: Innovation is a way of life, a habit and that can be inculcated through constant drills and/or open forum discussions. Innovation comes naturally to some and not so naturally to some but it’s innovation that helps us move forward, evolve. So it’s important that personnel constantly look for ways to improve processes, methods, efficiency etc. Additionally, they must also know how to gain confidence of stake-holders as ‘innovation, seemingly random, too needs channelization’. Sunny: Share your advice for NGOs as there are little resources in technology. We are working in slums – L&D for community workers? Me: Technology is not the answer, it’s only new – L&D has been there since earth. Use basics to let them express & learn. True learning happens when there’s a need, the concepts and content are aligned with the need and most importantly, when the learner is motivated to learn, and finds value in it. So in that, technology is just one of the enablers, not end all. Abhipsha: Considering the fact that orgs have started outsourcing L&D, how can it play a crucial role in driving business excellence? Me: It’s about right solutions – outsource or in-house – don’t look at costs, they cover up! I believe that learning and education are not business; every business is an off-shoot of learning and education and not the other way round. Every business emerges from a certain learning and to sustain it we need learning. So the focus should never be on costs, the focus should always be getting the right and appropriate solutions which come through – extensive need analysis; and innovative & relevant solutions. Benita: Is 360 degree feedback a must for Business Excellence? Me: Feedback is an opportunity to become better & strengthen – just the forum should be right & mind should be open, so yes! Generally speaking, we don’t have an appetite for 360 degree feedback, and so we operate in very closed communication channels, this further leads to a closed heart and mind. What this does? This shuns the path to a pool of possibilities and a sea of opportunities. And business is just about this – becoming more open to horizons, in fact creating more horizons! Abhipsha: L&D is treated as only a support function and not strategic enablers. How to bridge this gap? Me: L&D folks need to be Amitabh Bachhan of Zanjeer movie! Revolutionary, confident, believer and insightful. I have seen so many times when personnel from L&D, OD or Core HR don’t express their perspective clearly enough and this happens primarily because they deal with emotions and psychology of the team-members, something that can’t be easily quantified. So I constantly feel that if they could create systems to quantify their side of data and present it with stronger conviction, situations could be much better! Rishi: Talking of business excellence, what parameters or domains of biz can we look at to excel through LnD? Me: Biz is Biz, L&D needs to adapt to Biz not the other way. On hindsight, biz needs constant L&D to prosper! This question implies ‘what are the areas that can be developed in business’. And it’s just super important to consider that all areas of a business need development, only then can the business achieve an organic growth. Surya: How can L&D practitioners keep pace with disruptive changes in industry & business? Me: Read, talk to people, seek opinions, think critically, study patterns. If one is a professional of L&D then that person must truly understand the profession to the core, i.e., it’s about learning and development. Which means, this personnel must not only be aware of what’s happening at the market-place but also design plans for future and then align the stake-holders to implement them! Benita: Can LnD show ROI? How? Me: Yes, include evaluations not only for the learners but also their managers! If you go to a temple or an equivalent place of peace and serenity, many times you tend to lose that atmosphere outside because the atmosphere is not sustained. Same goes for a learning intervention, i.e., once learners go through a learning intervention, many times they don’t get a supportive atmosphere back on the floor/field. Here, the immediate manager plays an extremely crucial role to sustain and promote that learning and so generate the ROI. Hope you enjoyed reading the excerpt and found value in it. Do share your thoughts. For more discussions, refer to #LnDTalk on Twitter.